The Republican debates have repeatedly highlighted candidate differences on immigration and the Paris attack placed Syrian refugees on the front page. The issue may decide who is the Republican nominee. 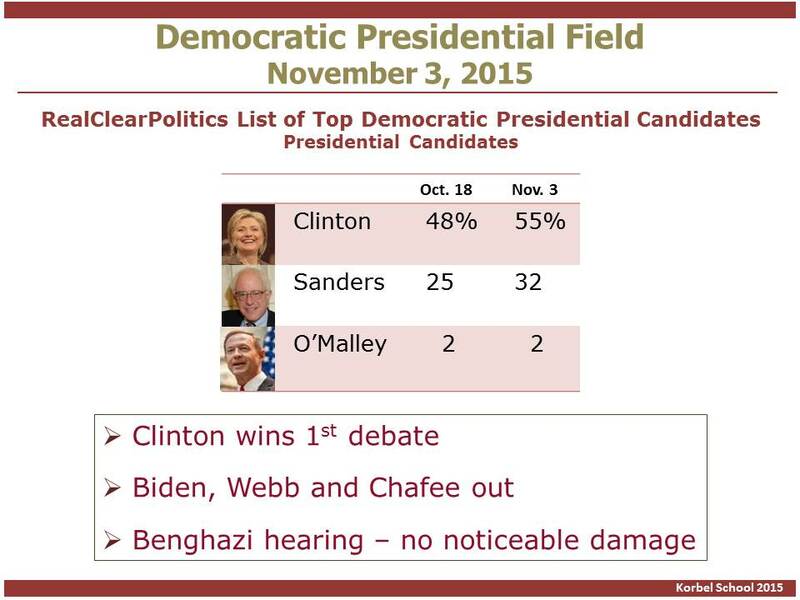 The candidates are making clear there is little room for any nuance. This is partially a reflection of the public’s visceral reaction to the Paris massacre, but it also expresses the long-established Republican rank and file hostility to America’s immigration policy. A poll in the last week shows a majority of Americans opposing accepting Syrian refugees, which corresponded to more than half the states’ governors stating they wouldn’t accept any. Their authority on the issue is not clear, but the politics is clearly controversial for most politicians and has a litmus test quality for Republicans. 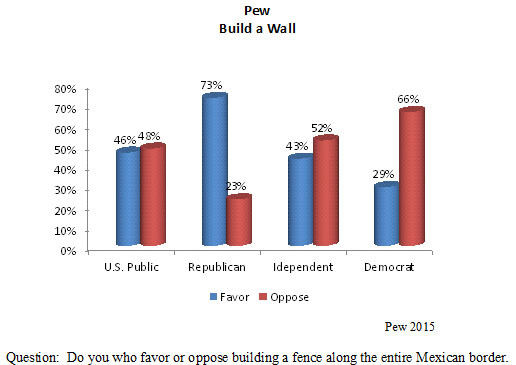 The public is closely divided on the question of building a fence along the entire U.S.-Mexican border (46% favor, 48% oppose), but Republicans are overwhelmingly in favor (73%). U.S. immigration policy’s linkage with terrorism may give Republicans an advantage with an issue that had considerable downside risk with both immigrant populations and more reasonable voters who can support a path to citizenship if accompanied with sufficient conditions. Not since President George W. Bush in 2001 has the world heard the term “act of war” as frequently as it has since Friday’s Paris massacre. President Obama rejected the war terminology and banned it in his first year of office. The War on Terror became a criminal justice activity in America and a special ops strategy to attack specific terrorist cells and networks abroad. Further, the administration refuses to label various perpetrators of terror and the leaders of the ISIS Islamic terrorists. Obama’s statement of sympathy after the attacks highlights his philosophy of a narrow engagement with ISIS. He made no reference to Islam and offered to support the French “bringing the terrorists to justice” and go after terrorist networks and help on investigations. It appears his approach is being swept aside by the horrific events and leaders, both foreign and domestic, who intend on a more aggressive response to ISIS. As Barack Obama’s presidency ends, his foreign policy accomplishments are becoming increasingly muddled. Events and politics are undermining his goal to reduce the American military involvement and depend on diplomacy. The Paris attack is just the latest and most serious blow. A quick scan of world hotspots highlights Obama’s problems. Ukraine. Although a fragile cease fire is holding in Ukraine, mostly due to Russian interest in maintaining it, pressure is building from regional allies to step up NATO’s ability to counter Russia’s newly honed skill at disrupting neighbors with a so-called “hybrid war.” The long-term trend of reducing troops in Europe is now in reverse as men, war materials and exercises with NATO partners increase. Although Obama has kept the U.S. out of arming Ukraine and provided only minimal assistance, pressure is building to do more. And while it is unlikely Obama will change policy, the next administration may. The momentum is for more action, not less. President Putin has shown himself as an effective opportunist. His military is getting stronger and his aggressive nationalism is playing well at home. Asia. The administration pivoted to engage China where possible and counter it where needed. But China is a difficult power to manage. As the recent naval exchange in the South China Sea around China’s manmade islands make clear, America’s basic role in ensuring navigation and protecting allies is being threatened, and neither President Xi Jinping nor his military is likely to change the direction they are on. It will be a major challenge for the next administration. Iran: The nuclear agreement is his signature policy. 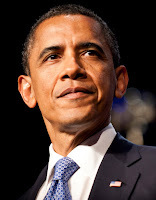 It contains Obama’s desire to change policy direction, use diplomacy, engage allies and achieve a laudable goal. But the agreement doesn’t have domestic support, and as Iran’s recent rhetoric and behavior makes clear, they have no intention in opening the country up to Western influence or especially Americans or dampening their regional support for Shia-inspired conflict. Libya: An effort to help allies and protect a people without follow-up has left a failed state and a platform for Jihadists. Israel and Palestine: No real progress and an alienated Israel leadership. Iraq: Withdraw completed in December 2011, but in September 2014 had to re-introduce air power and a few support troops to fight Sunni army that filled the vacuum of power. Little progress after the year of militarization. Syria: After proclaiming Assad must go did little to encourage it when it might have helped. Obama finally adopted a policy of training and arming an army of anti-ISIL moderates, which spectacularly failed. ISIL took advantage of the vacuum and now Russia props up Assad and makes war on both so-called moderate anti-Assad forces and ISIL. Afghanistan: Afghanistan is where Obama reluctantly accepted military advice for a surge of troops, but added a withdrawal date. The mission is generally not going well and a small number (probably insufficient) of troops will remain. Even before the Paris tragedy, the domestic criticism from Republicans and some Democrats is as heavy, if not as lethal, as the shooting in the field. As this scan indicates, Obama’s foreign policy goals are mostly under attack from foreign actors who do not share his or America’s goals and values and do not play by his rules. There have been some highlights and he has a few more goals, such as closing the Guantanamo facility, but he will be mostly playing defense the next twelve months. 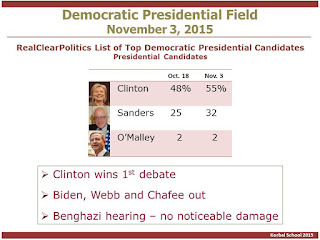 Nine days in October from the Democratic debate on October 13 through the Benghazi hearing on October 22, Hillary Clinton took command of the nomination of the Democratic Party. Her steady performance in the two events won plaudits and the ending of Joe Biden’s shadow campaign extinguished the doubts that had come to overshadow the campaign from its April start through the summer and fall e-mail controversy. Endorsements, many of whom are Democratic convention super delegates (Clinton claims more than 400 on road to 2,250 needed), and campaign contributions, which are now rolling into the campaign and her super PAC ($30 million in last reporting period; total through June - $98 million, $20 million in super PAC). Her polling position is well above half the Democratic Party voters nationally and she is now even with Bernie Sanders in New Hampshire, the only early state he had registered a lead. Of course, Clinton still has an outstanding investigation, but that is hardly a new phenomenon for the Clintons. Republicans should not depend on it to derail her nomination. Keith Coffman in a Reuters post-Colorado recall election story points out that the Jefferson County recall election involved a host of issues beyond just the Board’s perceived anti-union approach. Although the loss of union control in a well-off suburban school district was a “challenge to their survival,” I pointed out in that the large margin of the recall victory “showed there was wider discontent with the trio’s performance” (the school board’s conservative majority). In an effort to reverse school reform (a word in some controversy) in Colorado, the national and local teachers union orchestrated a statewide counterattack on conservative board members and picked up seats in the Douglas County, Adams 12, Colorado Springs 11, Steamboat Springs, Mesa and Greeley. They took back control of Thompson School District in Loveland. Two very identifiable tiers have been established in the Republican nomination field: Donald Trump and Ben Carson in the lead, followed by Marco Rubio and Ted Cruz, both of whom benefited from their CNBC debate performances. But Republicans, especially the very power establishment, remain unconvinced that Carson can either go the distance or has the depth to be the nominee, and Trump’s ad hoc campaign and lack of a predictable philosophy causes considerable anxiety. Talk has begun that no candidate gets much more than 30 percent of the delegates, and there could be the feistiest brokered convention since 1948 and the Dewey nomination (3 ballots). Although the Republican Party and presidential candidates are angry with NBC News, this latest NBC News/Wall Street Journal poll is likely to be accepted as an accurate snapshot of the race (10-29-15). Carson and Trump do not seem to be going away, which was expected by much of the Republican establishment. 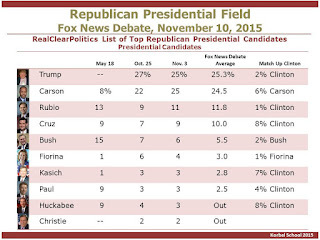 Along with Rubio and Cruz, the four lead in the latest poll, which seems to blend the results of the CNBC debate with the continued ascent of Ben Carson. 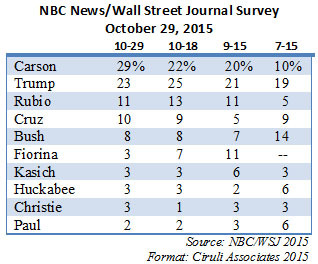 The last four NBC/WSJ polls show the steady improvement of Carson to the lead at 29 percent, the plateau of Donald Trump at or below the mid-20s, and consistent leadership of the second tier by Marco Rubio and Ted Cruz. 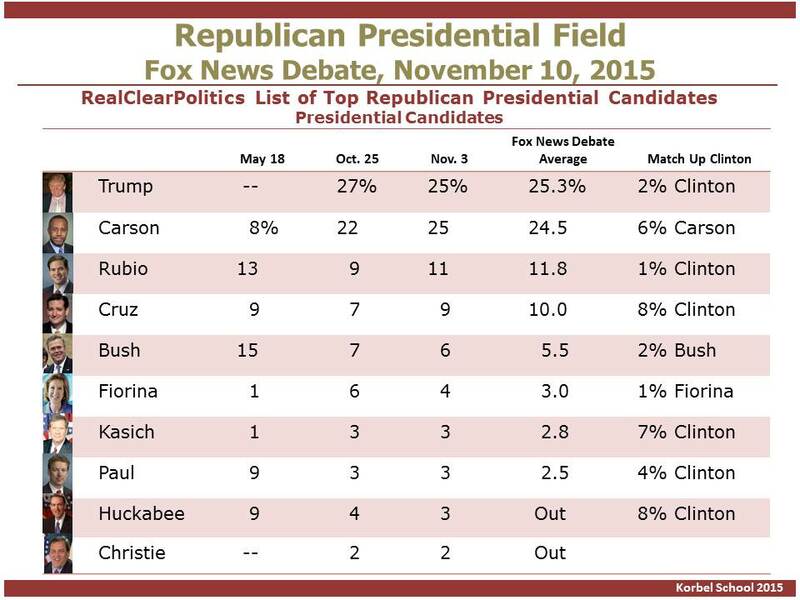 Jeb Bush is now the straggler in the tier. The third tier has shown no movement, with the exception of Carly Fiorina’s bump up after the October debate, but it appeared to quickly decay. The post-debate NBC News SurveyMonkey poll showed a very angry Republican electorate, which judged Cruz the overall debate winner with 24 percent, Rubio second at 20 percent, with Carson (15%) and Trump (17%) closely following. Importantly, Trump wins “best at handling the economy” hands down at 41 percent. Nearly half (48%) of Republican voters are very dissatisfied with how Washington works and they mostly supported Trump and Carson. Trump is stronger with men and Tea Party supporters and Carson wins Evangelicals and “very conservative” voters and does better with women than Trump. The brief Trump and Carson can’t or won’t win the nomination. They will implode (becoming less likely as time passes) or the polls will show they will destroy the entire ticket and the establishment will revolt (possible). Independent money PACs (Citizens United) have given campaigns, even weak ones, enough cash to get to the first few nominating events; i.e., into early March. An optimist belief that lightning could strike and an opponent collapses or a debate-type breakout occurs. There were a few surprises in this election, but the Denver predictions made in my blog on September 3 held up (Denver Voters Face Five Major Issues in November: Prediction). I reported them on 9KUSA and 850 KOA Monday. In my blog on October 30, 9KUSA: Balance of Power – Jeffco Recall Election, I predicted the pro recall forces would win. As I said on KOA, you expect proponents who go to all the effort to petition a recall and spend hundreds of thousands of dollars are going to have the advantage. The conversation in Denver the last two weeks was that longtime political activist and school board president, Happy Haynes, was in trouble. Besides the controversy related to two jobs, people talked about the outsider advantage and made reference to the Chris Nevitt rule, that is, a surprise loss for the establishment candidate. Floyd Ciruli (L) and Gary Shapiro talk about the election.